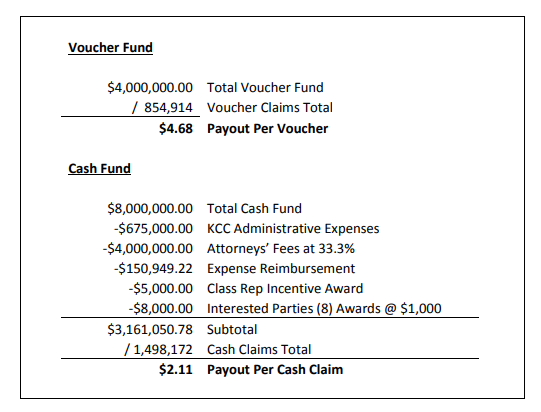 The reported value per claim in a class action settlement can differ significantly from the actual check a class member receives. Both StarKist and Trader Joe’s have faced class action lawsuits involving damages for allegedly under-filled cans of tuna. Both defendants settled for cash amounts in the range of $25-29 per claim (although StarKist also offered $50 product vouchers in the alternative). The value reduction occurred in part because of the popularity of the settlement with class members, who filed claims in record amounts and thereby diluted the Settlement Fund pot to be distributed. However, even at the reduced payout, Plaintiffs’ counsel described the amounts as “an excellent recovery that will fully compensate most Class Members for 100% of their alleged losses, and possibly more”.